Either, but not both, methods shall be permitted to be used on the same piece of equipment. The results of an incident energy analysis to specify an arc flash PPE category in Table 130.7 (C) (15) (c) shall not be permitted. NEC 110.16 Flash Protection - Electrical equipment, such as switchboards, panel-boards, industrial control panels, meter socket enclosures, and motor control centers, in other than dwelling occupancies, that are likely to require examination, adjustment, servicing, or maintenance while energized, shall be field marked to warn qualified persons of potential electric arc flash hazards. The marking shall be located so as to be clearly visible to qualified persons before examination, adjustment, servicing, or maintenance of the equipment. Simply put: Employees shall have the appropriate PPE for Electrical Hazards present. 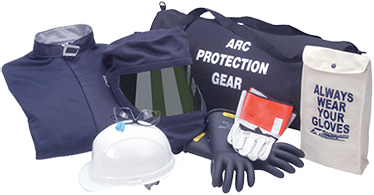 The only way to determine if hazards are present is to perform an Arc Flash and Shock Hazard Analysis. How do you protect an employee from a hazard if you don’t know the extent of the hazard? Simply put: Companies need to have a record of their analysis and date in which it was completed.